Most sequences have been shot in arctic northern Norway, close to the city of Tromsø. One sequence is from Finland and one from Sweden. The city sequences you see are shot in and over Tromsø, which in Norway often is referred to as “the northern lights city”. BTW! This year the coast of northern Norway was overwhelmed with humpback whales, which are absolutely magnificent and beautiful creatures. While watching the auroras and shooting the opening sequence of this video I could hear the whales breaching and blowing air in the fjord. It was an absolutely magic experience. Sadly the whales never came close enough to do a really good shot of the whales under the auroras, but If you watch closely on the opening sequence you can actually see the whales breaching a few times a bit out in the fjord. Three years ago BP's Deepwater Horizon oil rig exploded in the Gulf of Mexico killing 11 workers and causing the worst environmental disaster in US history. The cost to local businesses, to the environment and to BP itself has been immense as BBC reports from the Gulf coast of Louisiana. WSJ : Should the U.S. expand offshore oil drilling? Last year, a group of Australian researchers "undiscovered" an island the size of Manhattan in the South Pacific. A mysterious place called Sandy Island had popped up on maps, northwest of New Caledonia. It even showed up as a black polygon on Google Earth. But when scientists sailed there last November, they found open water instead of solid ground. In an obituary for the island published this month, the researchers explained why the phantom landmass had been included on some maps for more than a century, pointing to some human errors and a possible pumice raft. 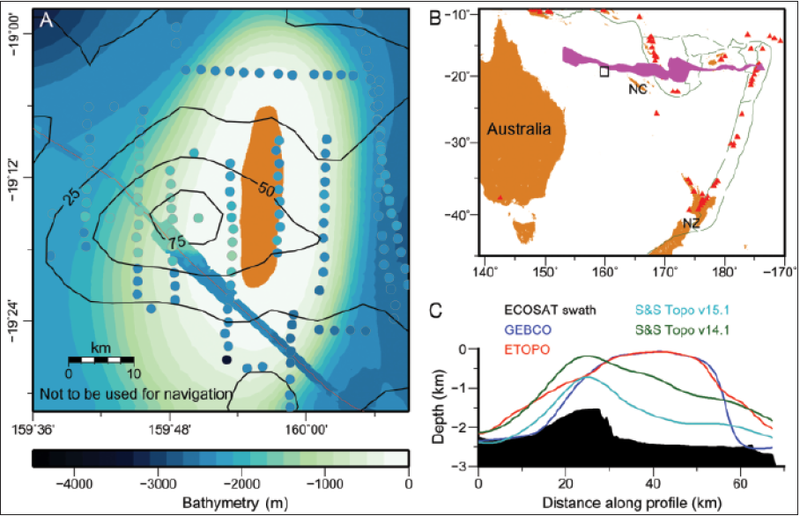 C Bathymetry profiles along the ECOSAT transit line. ECOSAT swath bathymetry, shown in black, is much deeper that the calculated by the other global bathymetry models. Sandy Island was first recorded by the whaling ship Velocity in 1876 and first mentioned on a British Admiralty chart in 1908. But future expeditions failed to find the island, and it was removed from some official hydrographic charts by the 1970s. 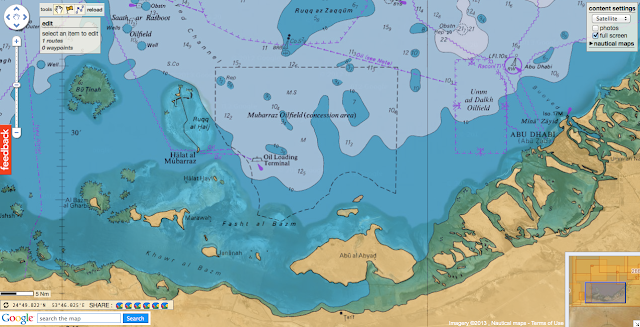 However, the errant island stuck on some maps and then crept into digital databases like the widely used World Vector Shoreline Database, which was developed by the U.S. military. "During the conversion from hard-copy charts to digital formats the 'Sandy Island' error was entrenched," said Maria Seton, of the University of Sydney. But what did the crew of the Velocity see in the first place that led to the false discovery of Sandy Island in 19th century? Seton and her colleagues speculate that it might have been a giant pumice raft. Pumice forms when volcanic lava cools quickly, trapping gas inside and creating lightweight rocks that can float. Last summer, an erupting undersea volcano called the Havre Seamount sent pumice drifting off the coast of New Zealand across an astounding area of 8,500 square miles (22,000 square kilometers). And Sandy Island happens to sit along a pumice "superhighway." "It is believed that wind and ocean surface currents in the area combine to funnel pumice rafts through the area between Fiji and New Caledonia on their way to Australia," Seton and her colleagues wrote in an article in the journal EOS. "The formation of this 'pumice raft superhighway,' which passes by the location of Sandy Island, lends weight to the idea that the Velocity may have captured a moment when some sea‐rafted pumice was traversing the area." In January 2010, a crew of scientists voyaged by ship from the southern tip of Chile into the frigid Antarctic to search for clues to one of the great unknowns of climate change. They planned to crisscross a remote patch of sea near the spot where, a year earlier, another crew had injected a tankful of an inert chemical one mile below the surface. The new crew had seven weeks of funding and good weather to sample the seawater throughout the region and discover where the chemical went. By mapping its spread over the course of the year, the scientists hoped to disentangle the forces that drive the circulation of the Southern Ocean — one of the most important, but least understood, regulators of Earth’s climate. But four days from port, the ship’s captain died in the night. “There was a lot of confusion,” said Angel Ruiz-Angulo, a scientist on board. Out of helicopter range, the crew had no choice but to put the captain’s body in a refrigerator designed for seawater samples and set course through gale-force winds for Punta Arenas, Chile, with the first mate at the helm. On shore, a short service was held, and the ship was examined. Then the scientists quickly returned to sea. A long exposure photograph of the Southern Ocean from aboard the Roger Revelle. “It was a somber mood,” said Jim Ledwell, an oceanographer with Woods Hole Oceanographic Institution and chief scientist on the expedition. But there was little time to reflect. With only five weeks to collect data, Ledwell formulated a plan to reduce the number of stops the ship would make, focusing on the most essential sampling locations. “Jim managed to handle everything very well. The results were as good as they could have been otherwise,” Ruiz-Angulo said. The data are now part of emerging models that are expected to yield a far more accurate picture of future climate change. “What happens in the Southern Ocean has a profound impact on what the climate projections are 100 years from now,” said Sarah Gille, an oceanographer at the Scripps Institution of Oceanography in San Diego and, along with Ledwell and others, a principal investigator on the Diapycnal and Isopycnal Mixing Experiment in the Southern Ocean, or DIMES campaign. At the high end of that range, many coastal and arid regions that are currently home to humans would become uninhabitable, subsumed by sea or desert. The Southern Ocean plays an outsize role in containing global warming, swallowing an estimated 10 percent of the heat-trapping carbon dioxide that humans pour into the atmosphere. But the ribbon of water surrounding Antarctica may be absorbing less carbon than it used to, a study in the journal Science suggested in February, possibly because strengthened winds are dredging up more sunken carbon from the seafloor and causing it to saturate the surface waters. Because subtle changes can trigger a feedback loop in fluid dynamics, some researchers think the Southern Ocean could eventually switch from absorbing carbon dioxide to emitting it (as may have occurred in the ancient past), which would further escalate global temperatures. A schematic of global ocean circulations developed by DIMES principal investigators John Marshall of MIT and Kevin Speer of Florida State University in 2012, based on the current understanding of ocean dynamics. Cooler colors indicate denser water masses. The Southern Ocean has a powerful effect on Earth’s climate because it “provides a connection between the atmosphere and the deep ocean,” said Andrea Burke, a marine chemist doing postdoctoral work at California Institute of Technology who is not involved with DIMES. It circles Antarctica, enabling surface winds to drive it eastward in a continuous loop. The Antarctic Circumpolar Current, as it’s called, has an average or “mean flow,” while buildups of surplus energy erupt into eddies — circular currents tens of miles across that stir the water and, in a feedback process, reinforce the mean flow. Because cold, dense water is farther below the ocean’s surface toward the equator than near Antarctica, ocean layers of constant density slope upward as one moves north to south across the Southern Ocean. Eddies and the mean flow draw water from the depths to the surface along these southward inclines, then drive it down again as it moves northward — a conveyor belt called an “overturning circulation” that scientists say is the biggest on Earth. These circulations conspire to make the Southern Ocean a remarkably efficient absorber of greenhouse gases, which are swallowed at the surface and channeled to the seafloor. And as a driver of global ocean currents, the Southern Ocean bolsters the impact of the other oceans on the climate, too. But because of the complexity of ocean dynamics, climate change effects — strengthening surface winds (also caused by the hole in the ozone layer) and the 0.8 degrees C (1.4 degrees F) rise in average global temperatures since the start of the Industrial Revolution, for example — could drastically alter these circulations decades from now. “Understanding the feedbacks between the mean flow and the eddies is critical to understanding future climate change,” said Emily Shuckburgh, an applied mathematician at the British Antarctic Survey and a DIMES principal investigator whose research over the past decade has highlighted the complex role played by eddies in ocean dynamics. Simulations of Southern Ocean circulation at two levels of resolution. The model on the left, which uses a grid with 1-degree resolution, does not resolve ocean eddies, whereas eddies are resolved in the 1/6-degree model on the right. Despite their importance in driving large-scale ocean circulations, eddies are not fully represented in climate models like those used by the Intergovernmental Panel on Climate Change (IPCC), Shuckburgh said. Those models are created by solving an interrelated system of equations at every point on a grid representing Earth. The finer the grid, the more geographic features a model can take into account and the more precisely it can predict the flow of materials such as heat and CO2, which directly impact climate. But ocean eddies are too small for even the most powerful supercomputers to resolve in models of the entire planet. Because these unresolved features strongly influence the behavior of larger features, such as the mean flow and the overturning circulation of the ocean, leaving them out of the picture creates large uncertainties in the models. The working solution is to “parameterize” ocean eddies by incorporating a term into the equations used in coarse-grained climate models that attempts to capture their net effect. For years, this eddy parameter has been estimated based on satellite measurements and scattered temperature records. “We looked at this and said, ‘This is all great, but no one has ever measured the way that eddies flux heat or CO2. How do we know this has any basis in reality?’ ” Gille explained. Climate science has suffered from a relative lack of studies of the Southern Ocean “because of its remote location and harsh weather,” Burke said. A rare collaboration of oceanographers, chemists and applied mathematicians in the United States and United Kingdom, the DIMES experiment was founded to fill the gaps in knowledge of the Southern Ocean. About twice per year since 2009, crews from each side of the Atlantic have taken turns traveling to the bottom of the planet to conduct experiments and collect data at sea, which will later be assimilated into climate models. It’s a long way from the math department at Cambridge University where Shuckburgh spent much of her career. “You understand much better the errors in the measurement if you’ve actually seen how it’s done,” she said. During the first voyage, the scientists released 80 kilograms (176 pounds) of an inert compound called trifluoromethyl sulfur pentafluoride, or CF3SF5, from a sled being dragged behind their ship a mile underwater. The molecules serve as a “tracer,” mapping the influence of eddies as they corkscrew through the ocean. In subsequent voyages — the seventh is currently under way and has its own blog — the crews have tracked the spread of CF3SF5 by collecting thousands of water samples. Video: Tracer Diffusion Simulation of the spread of the chemical tracer between February 2009 and October 2010, created using a tracer advection-diffusion model that was calibrated using satellite measurements of surface currents and tracer concentrations in water samples collected one year after release. “We have such amazing sensitivity that we can run the experiment for five years, and we can still see the tracer after it has spread over thousands of miles of ocean,” said Ledwell, who has spent three decades developing the method. Just like stirring helps disperse milk in coffee, the scientists expect the tracer to spread faster in eddying regions than elsewhere, especially at depths where eddies tend to swirl in place. Throughout the region, the crew released 200 neutrally buoyant floats that can be tracked with acoustics. The floats map the locations and paths of eddies as they drift through the water, and tracer measurements are then compared to this eddy map. At the ocean surface, Shuckburgh led another float experiment that tested a novel approach to the study of fluid flow. Over the past decade, applied mathematicians led by George Haller, now of ETH Zurich in Switzerland, and others have discovered the mathematics describing rigid barriers that form in fluids called Lagrangian coherent structures. These structures, which are associated with eddies, organize turbulence by repelling fluids from areas known as stable manifolds and shunting them along contours known as unstable manifolds. Shuckburgh used satellite records of the Southern Ocean surface winds to guess the locations of hyperbolic points, where stable and unstable manifolds meet, and released GPS-rigged floats in those spots. “People thought we were mad,” she said. The floats traced the arms of the hypothesized unstable manifolds almost exactly, lending support to this new conceptual framework for characterizing turbulence. “I find it remarkable that a relatively low-budget experiment can provide such convincing evidence for the major role played by Lagrangian coherent structures in ocean mixing,” Haller, who was not involved with the experiment, said by email. In new research forthcoming in the Journal of Physical Oceanography, Haller and his colleagues argue that the theory of Lagrangian coherent structures can be used to locate and characterize eddies more precisely than traditional methods and that eddy-resolving climate models should eventually adopt the technique. Other researchers are using Lagrangian coherent structures to predict the spread of pollutants from oil spills, fluid flow in hurricanes, airplane turbulence and marine animal foraging patterns. Ocean modelers on the DIMES team have begun to assimilate the tracer and float data into their models. At the Scripps Institution, Gille’s team will use it to determine boundary conditions: uncertainties such as rainfall, movement of heat through the surface, evaporation and wind speed that can be dialed up and down in the models across a range of values. “By allowing those to vary, we can match the DIMES data and data from other sources,” Gille explained. The values that match the data are then locked in to the model. Other DIMES researchers are using the data to refine eddy-resolving models of the ocean. The outcome of their simulations will help them tune eddy parameters in climate models of the entire Earth. “The eddy parameterization that we thought might work does to some extent, but there seem to be serious deficiencies,” said Kevin Speer, a physical oceanographer at Florida State University and DIMES co-principal investigator. As the Antarctic Circumpolar Current passes over seafloor mountains and ridges, the bumps in its flow propagate upward through the water column. This vertical turbulence in turn interacts with eddying in the horizontal direction. Altogether, the tracer data indicate that vertical mixing of heat and CO2 is 20 times greater in rough-bottomed regions compared with smoother parts of the ocean. “Ultimately, in the next few years, we should be giving climate modelers some suggestions for how to incorporate that inhomogeneity into the mixing,” Ledwell said. “This is going to be one of the legacies of DIMES,” Speer said. Other preliminary work by modelers on the DIMES team suggests that eddy-parameterized models accurately portray basic ocean circulation patterns, Gille said, but eddy-resolving models provide more details about where heat is transported and could therefore reveal country-specific impacts of climate change. The next IPCC report, which comes out in September 2013, will not incorporate findings from the DIMES project in its climate models. But the major modeling centers that are developing models for the following report, Shuckburgh said, are honing the representation of eddy processes in the Southern Ocean with the help of DIMES results. On Nov. 1, 2012, Abhilash Tomy embarked on a five-month non-stop solo journey around the world. 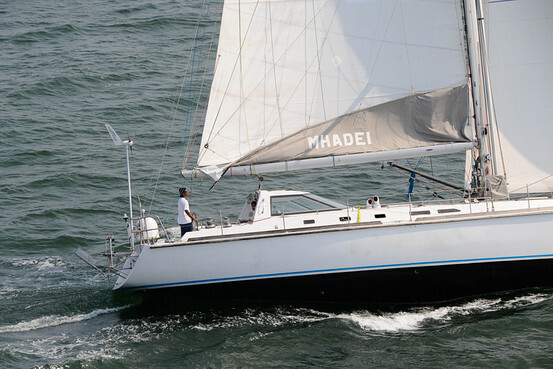 In Mumbai, Mr. Tomy boarded a sailing yacht called “Mhadei,” and traveled 23,100 nautical miles (around 40,000 kilometers), brushing past the coasts of Australia, New Zealand, Chile, South Africa and the Maldives before returning to India. Mr. Tomy, the first Indian to circumnavigate the globe alone and non-stop, arrived at Mumbai’s Gateway of India on March 31 after 150 days of travel. An officer in the Indian Navy, Mr. Tomy celebrated his 34th birthday on the 56-foot long boat when he was sailing in the South Atlantic. Mr. Tomy – who in the navy happens to be a pilot – is now planning to go on a long holiday. “My body needs to recover,” he says. In an interview with The Wall Street Journal, Mr. Tomy talks about reading philosophy, surviving cyclones, and his sense of loss at returning onshore. Edited excerpts. The Wall Street Journal: Did you always dream of sailing around the world solo? Abhilash Tomy: I always dreamt of spending time at sea. I grew up reading a lot of naval adventure, books of R.M. Ballantyne and Robert Louis Stevenson and people like that. WSJ: What did your typical day look like? Mr. Tomy: I’ll do my meditation by 6:00-6:30 a.m.
By 7 o’clock, I have my weather reports coming in. I would pour over the weather charts for one or two hours. At 8 o’ clock I would make my morning report and at 9 o’clock I had breakfast. By 10, I walked around the boat to see what work I needed to attend during the day. Then I planned out my work so that I could finish it all before sun set. WSJ: How did you keep yourself busy during the journey? Mr. Tomy: If I did have some free time, I would usually sleep. You do a thirty minute sleep, then wake up, do a light reading, sleep again, check everything is O.K. and keep repeating the cycle. Other than that, I had a lot of books to read and I carried a lot of movies and all. Then cooking would require a lot of time. Working on the boat would take lot of my time. WSJ: What kind of books and movies? Mr. Tomy: ‘One Hundred Years of Solitude,’ [by Gabriel Garcia Márquez] which I read at least once a year, ‘The Story of Philosophy’ by Will Durant, and ‘The Black Swan’ by Nicholas Taleb. I watched loads of movies, I was watching classics. Mostly in English, hardly any in Hindi or in any other language. WSJ: Did you take music as well? Mr. Tomy: I did but I didn’t really listen to too much music because if you continuously listen to music, you are eating up the boat’s batteries. WSJ: What kind of food did you take with you? Mr. Tomy: I got a lot of pre-cooked food from Defence Food Research Laboratories. All we have to do is just heat those packets and you can have them. I had a lot of freeze dry food that came from New Zealand. I carried rice, lentils, energy bars, chocolate, soft drinks, nuts, dry fruits etc. etc. My grandfather gave me pickled fish. We made up a mixture of all these things and divided them into months. Each month, the weight should be around 20 kilos. Every month the box would have say X amount of energy bars, X amount of snacks etc. WSJ: Did you ever you feel lonely? Mr. Tomy: No, I like being alone. So I never felt lonely. WSJ: How difficult was it to do regular household things like washing clothes or taking a shower? Mr. Tomy: I have been living in the boat [in Goa] since December 2011. So because of that I got used to everything inside the boat. Cooking was not very difficult. In fact, most of the time I would brush my teeth with sea water. And washing clothes is very easy. I had to soak clothes in detergent and sea water for about a day. I just soaked the clothes, tied them to a rope and throw them overboard. Clothes would trail along and get cleaned. WSJ: What were the challenges that you faced during the expedition? Mr. Tomy: The weather was the biggest challenge. And because the weather is always so rough, things keep going wrong. It’s like you live in a house and you have a cyclone going on outside for the entire month. Your house will sustain damages. So, that’s what it’s like when you are at sea. Because you are living virtually inside a cyclone for months at a stretch, things start breaking down and you keep repairing them. My generator had an issue. Then the engine one day stopped starting. Then I had to change another sail at sea. WSJ: Were you ever tempted to stop at any point? Mr. Tomy: No, I had problems but on the other side I was able to repair all those issues or I was able to work around them. The boat was always in a better shape than I had imagined, as far as my planning was concerned. There was no question of stopping. WSJ: How did you feel when you finally set foot onshore? Mr. Tomy: The feeling was a sense of loss. I was really sure that I would be more comfortable at sea than onshore. WSJ: Any tips for aspiring solo sailors? Mr. Tomy: Do not keep preparing all your life. You just need to build your boat and sail out someday. More than 50 million bombs, shells, detonators and cartridges from World War II are rusting away on the floor of the North and Baltic Seas or are washing up on beaches. Authorities are opting not to remove the ordnance -- and hoping no one gets hurt. Lorenz Marquardt has been sailing the Baltic Sea for more than 53 years, but the 68-year-old fisherman has an "uneasy feeling" whenever he leaves Eckernförde, in the northern German state of Schleswig-Holstein, for the Danish island of Bornholm. An invisible threat lies dormant beneath him as soon as he reaches the rich fishing grounds around the island. To fish for cod, his cutter drags a bottom trawl through the Bornholm Basin, which is 60 to 70 meters (197 to 230 feet) deep -- in precisely the spot where tens of thousands of bombs and shells were sunk after the end of World War II. 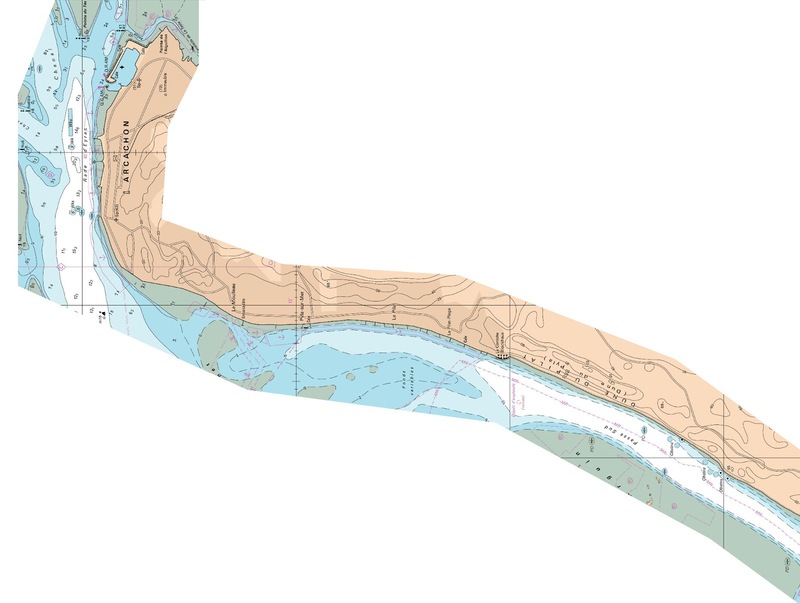 Nautical maps identify the area above the bomb cemetery as "contaminated (munitions)" or "contaminated (gas munitions)," and warn: "Anchoring and fishing are hazardous." German and Danish Baltic Sea fishermen take the risk because they can return to port with up to 10 metric tons of cod on their best days. That translates into several thousand fish, weighing one to 10 kilograms apiece (two to 22 lbs. ), and a very good catch can fetch €6,000 to €10,000 ($7,800 to $13,000), depending on the market price. Years ago, Marquardt pulled a 500-kilo bomb onto his cutter, together with the floundering cod. He was lucky, because the bomb wasn't porous yet. Bomb disposal experts destroyed the bomb on land, in Eckernförde. But since World War II, hundreds of Danish fishermen have been injured after pulling rusted shells containing mustard gas, which damages the skin, on board in their nets. The gelatinous material leaked from the metal shell casings, causing severe burns. There are more than 100 of these bomb and shell graveyards scattered along all of northern Germany's coastlines. There are also apparently 5,000 metric tons of shells filled with substances such as phosgene and the nerve agent tabun in the Little Belt, the strait between the Danish island of Funen and the Jutland Peninsula. Here, a WWII bomb is detonated in the Baltic Sea in 2010. Almost seven decades after the end of the war, residual explosives that were hardly taken seriously for a long time are now coming to light in the North and Baltic Seas. Experts estimate that there are 1.6 million metric tons of conventional and chemical ammunition in German territorial waters alone, unexploded time bombs lying in or on the sea floor. The unexploded ordnance (UXO) includes giant aerial bombs weighing hundreds of kilograms, 15-kilo shells, small high-explosive shells, hand grenades, detonators and ammunition rounds, for a total of more than 50 million individual items. No one knows how great the danger really is. "We are familiar with only a small portion of the areas contaminated with weapons," says Jens Sternheim, chairman of the "Munitions in the Sea" task force of the North and Baltic Sea Federal and State Committee. According to Sternheim, "munitions problems will increasingly come to light" during the construction of offshore projects, such as wind farms. Almost seven decades after the end of World War II, residual explosives that were hardly taken seriously for a long time are now coming to light in the North and Baltic Seas. Here, a diver prepares a bomb for detonation in the Baltic Sea. The problem was created both during and after the war. When the Allies disarmed the Germans after defeating them, they ordered that the weapons be disposed of at sea. Before that, the Nazis had occasionally sunk their own ammunition when, for example, they feared airstrikes against their poison gas storage sites. A report that Munitions in the Sea released a year and a half ago and is now updated lists many well known beach resorts along German coasts. If the UXO is washed onto land, is caught in fishing nets or is merely disturbed during preparatory work for pipelines and offshore wind farms, it can pose a danger to local residents, vacationers, fishermen and excavator operators. 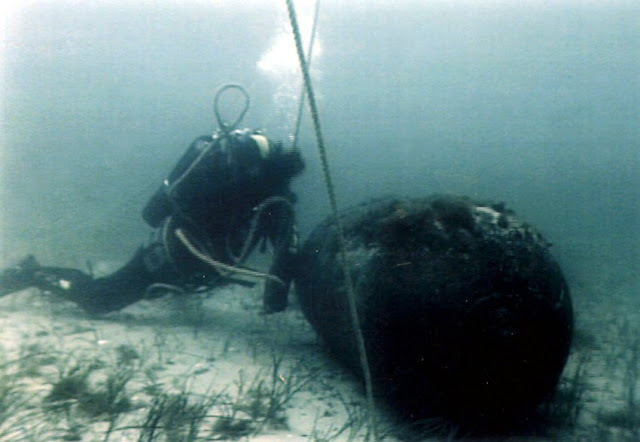 Last year, munitions clearing crews working in the Ems River estuary found two sea mines, massive metal spheres containing up to 300 kilos of explosives, which were intended to sink enemy ships headed for Nazi Germany. In July 2012, a tourist on the North Sea island of Wangerooge found the warhead of a German torpedo, which was also subsequently destroyed in a controlled detonation. Anyone walking in the tidal flats of the Elbe River estuary near the port of Cuxhaven should be alert. According to the expert report, "the munitions components, some of them lying openly exposed in the tidal flats, are dangerous." Explosions can happen almost anywhere. During construction work on the Riffgat offshore wind farm, about 15 kilometers (9 miles) northwest of the East Frisian island of Borkum, 2.7 metric tons of munitions were discovered and salvaged, and there are unexploded cluster bombs in the tidal flats south of Norderney, another East Frisian island. Walkers in the tidal flats near Kampen, a municipality on the North Sea resort island of Sylt, discovered two bombs in December 2012. The bomb disposal service assessed the find and detonated the two bombs after deeming them dangerous. Beachgoers usually have no idea what can be washed up at their feet. In July 2012, two children from the southwestern state of Baden-Württemberg who were playing on the beach in Kalifornien, a town near the northern city of Kiel, brought a 1.5-kilo lump of material back to their parents' vacation house. Suddenly the hands, T-shirt, jacket and pants of one of the boys turned a yellowish orange. The lump consisted of Schiesswolle 39, an explosive compound that the German navy used in WWII torpedoes and can cause skin irritation. 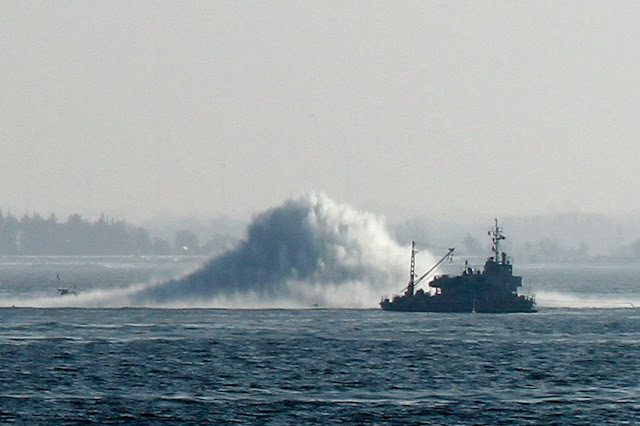 Dangerous UXO also lies under important shipping routes. When a munitions clearing crew began working off the Baltic Sea resort town of Travemünde in 2011, it discovered, at a depth of 20 meters, six warheads from V1 flying bombs in or near the channel used by the large ferries that depart from Travemünde for Scandinavia or the Baltic countries. There is also UXO in the Flensburg Fjord, in Eckernförde and Hohwacht Bays and, farther to the east, in the northeastern state of Mecklenburg-Western Pomerania, in the Bay of Greifswald and off the islands of Rügen and Usedom (see graphic). In September 1949, the British military administration had ordered the Germans to drop about 6,000 field artillery shells into the North Sea four kilometers south of the Helgoland archipelago. The shells were filled with 11.7 metric tons of the nerve agent tabun. The shells will probably remain on the sea floor until they disintegrate completely. For decades, Germany's states paid almost no attention to the dangerous legacy from World War II. In the end, it was not even a German government agency, but Stefan Nehring, a marine biologist and environmental consultant from the western city of Koblenz, who discovered one of the worst munitions graveyards in 2008. He had spent several years digging through mountains of records in the Federal Archives in Koblenz and the affiliated military archive in the southwestern city of Freiburg. While doing research in London, he uncovered concrete evidence of an especially heinous environmental crime: In September 1949, the British military administration had ordered the Germans to drop about 6,000 field artillery shells into the North Sea four kilometers south of the Helgoland archipelago. "Until then, German authorities had been unaware of the reports from the British National Archives cited by Dr. Nehring," the Schleswig-Holstein state government noted. The toxic waste disposal site was even a target area for the German military's torpedo attack exercises in 2010. Ships bound for the Port of Helgoland also sail near the area. The shells will probably remain on the sea floor until they disintegrate completely, at least according to a recommendation from Germany's Federal Maritime and Hydrographic Agency and the international Helsinki Commission, which is responsible for environmental protection in the Baltic Sea. The recommendation states that there is no concrete threat to shipping owing to water depths of about 50 meters, and that possible environmental damage is limited to the immediate vicinity. Nehring disagrees: "We're not talking about peanuts here, but a cocktail of chemicals in our waters." He wants to see a ban on fishing imposed off the Helgoland coast. He argues that even the interior ministry in Kiel, the state capital of Schleswig-Holstein, acknowledged four years ago that the sunken tabun shells are "highly dangerous objects, especially for fisheries, work on the sea floor (anchor maneuvers) and salvage operations." The authorities are even more concerned about the effects of UXO on land. Some beach resorts do a lot to minimize the risks for vacationers. From before the beginning of Easter vacation to the end of the fall vacation period, employees with the private ordnance-disposal firm KMB Kampfmittelbergung travel to Wangerooge every two weeks to walk with bomb-detection equipment along the eastern beaches between Breakwater B and Breakwater T, a roughly 3.7-kilometer route on which UXO has been discovered for decades. Last year alone, the KMB team found about 90 high-explosive shells, most of them small, 16 detonators, a torpedo head, a mine and various components of small munitions. Some of the most beautiful spots on the Baltic Sea coast are also burdened by this sinister war legacy. 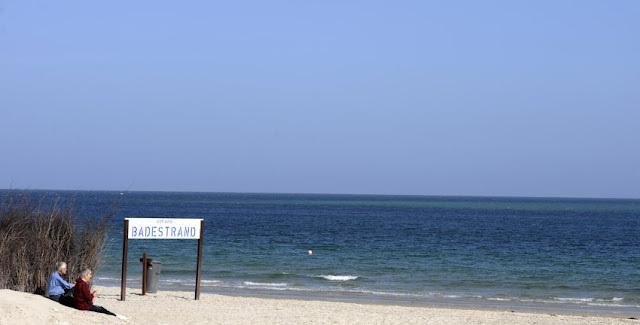 Usedom, Germany's second-largest island after Rügen, could be a truly idyllic seaside location if it weren't for the phosphorus accidents, the delayed consequence of a British air raid. In 1943, the British discovered that the Nazis were building a rocket in Peenemünde, a port village on Usedom. The V2 was being developed there under the direction of engineer and rocket scientist Wernher von Braun. 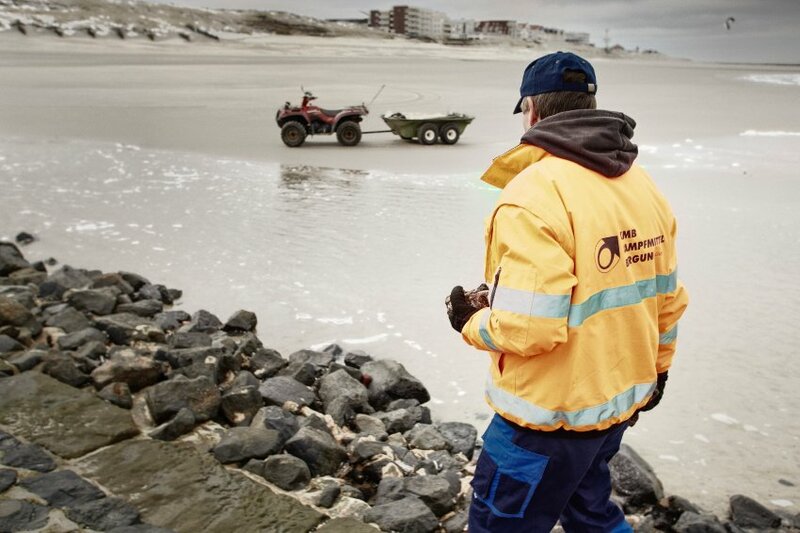 From before the beginning of Easter vacation to the end of the fall vacation period, employees with the private ordnance-disposal firm KMB Kampfmittelbergung travel to the North Sea town of Wangerooge every two weeks to walk along the beaches with bomb-detection equipment. On the night of Aug. 17, 1943, 596 Royal Air Force bombers dropped tens of thousands of bombs onto the test facility within a few hours. About 40 percent, including incendiary bombs filled with phosphorus, accidentally landed in the sea east of Peenemünde. Whether it happened in 1943, when the bombs burst upon contact, or in the ensuing decades as a result of corrosion, a large amount of white phosphorus leaked out of the metal casings. It became deposited on the sea floor and, especially during storm surges, makes its way onto land. It can become calamitous for the dozens of amber collectors who walk between Peenemünde and Zinnowitz on weekends, because even experts cannot distinguish the phosphorus lumps from amber at first glance. Accidents happen every so often. Tourists carelessly put lumps they believe are amber into their pockets. If pieces of phosphorus are heated to temperatures of between 20 and 30 degrees Celsius (68 to 86 degrees Fahrenheit), they can spontaneously ignite, emitting a darting flame with temperatures that can reach 1,300 degrees Celsius. Phosphorus is highly toxic, and merely touching it can cause organ damage. The administrator of the Usedom North region, Kerstin Teske, tries to reassure visitors, saying that the overall risk from phosphorus is low. She notes that there are one or two incidents a year, and that a total of 12 have been reported since 1990. Teske says that she also likes to go amber-hunting on the beaches. Marine biologist Nehring, on the other hand, recommends imposing a ban on gathering amber as long it remains unclear how much more phosphorus will wash ashore. The interior ministry in Schwerin, the capital of Mecklenburg-Western Pomerania, feels that a ban is not feasible because it would be difficult to monitor compliance. "How are you supposed to distinguish between an illegal amber-collector and a legal shell or rock collector?" asks one official. One approach is to provide amber-gatherers with metal containers at lifeguard stations. The containers reduce the risks of phosphorus exposure. But since local residents and tourists alike rarely use the containers, accidents are likely to continue in the future, such as one that occurred on the Baltic Sea coast a year ago. Two female tourists from the eastern states of Saxony and Saxony-Anhalt became the victims of a phosphorus flame, suffering second- and third-degree burns. A mention of the United Arab Emirates (UAE) coast might bring to mind the artificial islands near the city of Dubai. But to the southwest, the UAE coast is dotted with a complex mixture of natural features: mangroves, salt domes, salt flats, and coral reefs. 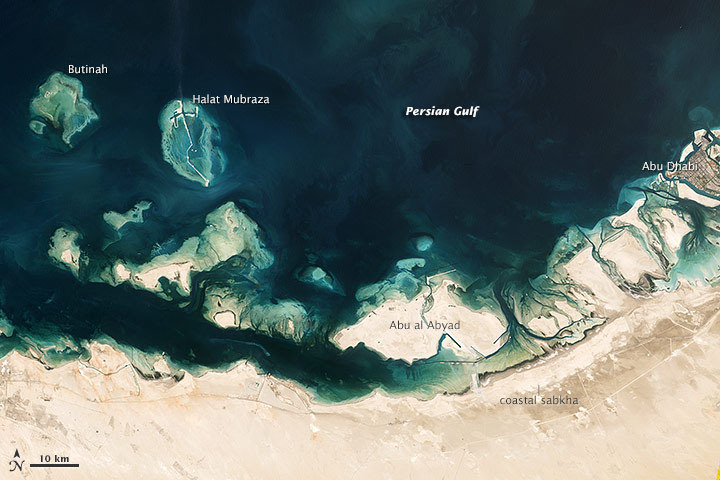 The Enhanced Thematic Mapper (ETM) on the Landsat 7 satellite captured some of this mixture on September 18, 2001, when it imaged Abu Dhabi (Abu Zabi) and the coastal region to the west. The area around Abu Dhabi is rich in mangroves—trees and shrubs able to grow in salty soil and water—that help prevent coastal erosion. Although mangrove forests typically occur in tropical and subtropical environments, the summertime temperatures along the UAE coast (often exceeding 35°C, or 95°F) pose challenges to mangrove survival. Mangrove forests here have grown in recent decades, according to the UAE government, thanks to large-scale re-forestation programs. Southwest of Abu Dhabi is a coastal sabkha, or salt flat, which extends more than 1.5 kilometers (0.9 miles) inland in some places. Most of the sabkha sits above the normal high tide level, but heavy rains or a combination of spring tides and storm surges can occasionally soak the surface. Water encourages the growth of mats of cyanobacteria, which lend the surface a wrinkled texture. When the water evaporates, brilliant white salt crusts remain. Pale beige sands blanket many of the coastal islands north and west of the sabkha, and some of the islands are ringed by coral reefs, which glow iridescent blue beneath the shallow ocean water. In the case of Halat Mubraza and Butinah, the corals dwarf the islands they surround. The reefs in this region are home to a multitude of species. Farther west are islands formed by salt domes. Compared to other types of rock, salt has a low density, and when buried by a relatively soft layer of rock, salt can rise up through the overlying layer like a balloon filled with helium. Off the UAE coast, some salt domes have poked above not only the rock layers, but also the ocean surface. Just off the edge of this scene (visible in the high-resolution download) is Sir Bani Yas, a salt dome island that now holds a nature preserve and orchards.